Your baby is placed in your arms after a tiring yet fulfilling labour, you look into their eyes and you are flooded with a rush of emotion. You are instantly bonded to this tiny bundle. Happens to everyone! Right? Not for me! I was woken up from a general anaesthetic and my beautiful baby boy was handed to me yet all I felt was numb and groggy. The last I remembered I was pregnant and all of a sudden I had a very real baby in my arms. There was no labour or natural delivery, just go to sleep, wake up and ta dah here’s your baby! We stayed in hospital for 3 days during which I picked up a sickness bug and just felt generally ill. The pain from the emergency c-section was worse than I had imagined it would be and the nights when Mr K had to leave us were awful. When I was told that I could go home if I wanted to I leapt at the chance. It was when we got home and were together as a family that I began to see things clearly. 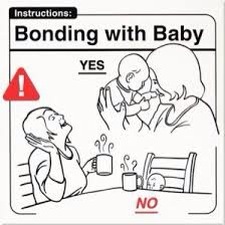 I loved my son but I didn’t feel particularly bonded with him. I felt terrible at this realisation! I must be the worse mother in the world! What could I do to change this? Obviously I googled it! The results that came up were actually very comforting. I found that it was perfectly natural to feel this way. I mean, I was only just getting to know this new person so naturally it might take a bit of time before we completely gelled. I took things a day at a time and when my son was about 6 weeks old I had a eurika moment! This was my son and he was mine! For some people that magical moment happens straight away but for others it may take some time. There is nothing wrong with that! Glad to read a post on this – nobody had really mentioned to me that I might not be filled with overwhelming love the first (or even the 20th) time I held my baby. I was the same. I had no idea that it was perfectly normal to feel that way. It really should be mentioned in antenatal classes or the midwife should tell you at one of the checks. When the midwife came to the house I put on a brave face and glossed over it because I didn’t want to admit to her that I didn’t feel bonded with my child. I think women would be more open if they were warned beforehand.